Seeing var _LP = Date.now(); when using the debugger? Debugger has its place, but I think you’d be better off using console.log() to figure out logic issues. That being said, since you are concerned about a loop exiting early, the problem then lies on whatever conditions are allowing the while loop to continue/discontinue. In this case, something about curr and num causes you to leave the loop early. should be looked at carefully. Think what you are doing in those lines of code and if it’s what you want to do. Can’t really help you any further without seeing the rest of your code, and perhaps copy pasting the code it to see the results. Thanks all! 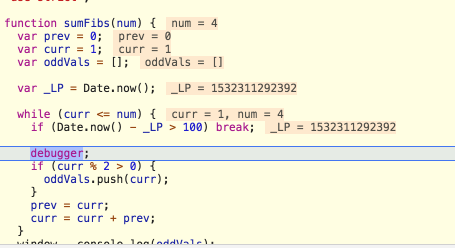 Just wanted to double check that it was my code that was wrong, and not this break statement that was causing my code to break from the loop. Also, good to know that it’s breaking based on ms of time spent in the loop. I’ll have to retract my debugger statement. I just prefer console.log because I can see everything, but when I look at this case, I’m completely wrong about the usefulness of debugger. So keep using debugger, and ignore what I said about it. Haha, yeah, the debugger can be incredibly powerful for problems like these, which is why it’s frustrating that it exits from the loop so early! Not really sure why that var has been added in. Oh well. and you were right about taking into account the first two 1s.